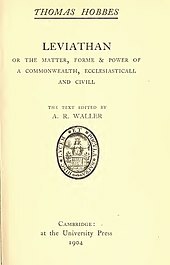 English, Latin (Hobbes produced a new version of Leviathan in Latin in 1668: Leviathan, sive De materia, forma, & potestate civitatis ecclesiasticae et civilis. Many passages in the Latin version differ from the English version). The title of Hobbes's treatise alludes to the Leviathan mentioned in the Book of Job. Unlike the more informative titles usually given to works of early modern political philosophy, such as John Locke's Two Treatises of Government or Hobbes's own earlier work The Elements of Law, Hobbes selected a more poetic name for this more provocative treatise. 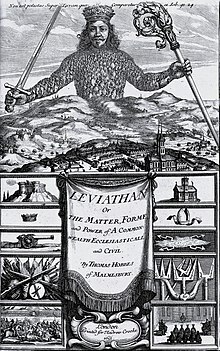 Lexicographers in the early modern period believed that the term "leviathan" was associated with the Hebrew words lavah, meaning "to couple, connect, or join", and thannin, meaning "a serpent or dragon". In the Westminster Assembly's annotations on the Bible, the interpreters believed that the creature was named using these root words “because by his bignesse he seemes not one single creature, but a coupling of divers together; or because his scales are closed, or straitly compacted together.” Samuel Mintz suggests that these connotations lend themselves to Hobbes's understanding of political force since both "Leviathan and Hobbes's sovereign are unities compacted out of separate individuals; they are omnipotent; they cannot be destroyed or divided; they inspire fear in men; they do not make pacts with men; theirs is the dominion of power." After lengthy discussion with Thomas Hobbes, the Parisian Abraham Bosse created the etching for the book's famous frontispiece in the géometrique style which Bosse himself had refined. It is similar in organisation to the frontispiece of Hobbes' De Cive (1642), created by Jean Matheus. The frontispiece has two main elements, of which the upper part is by far the more striking. Hobbes begins his treatise on politics with an account of human nature. He presents an image of man as matter in motion, attempting to show through example how everything about humanity can be explained materialistically, that is, without recourse to an incorporeal, immaterial soul or a faculty for understanding ideas that are external to the human mind. Hobbes proceeds by defining terms clearly and unsentimentally. Good and evil are nothing more than terms used to denote an individual's appetites and desires, while these appetites and desires are nothing more than the tendency to move toward or away from an object. Hope is nothing more than an appetite for a thing combined with an opinion that it can be had. He suggests that the dominant political theology of the time, Scholasticism, thrives on confused definitions of everyday words, such as incorporeal substance, which for Hobbes is a contradiction in terms. However, Hobbes states that there is a summum malum, or greatest evil. This is the fear of violent death. A political community can be oriented around this fear. Hobbes explicitly rejects the idea of Separation of Powers. In item 6 Hobbes is explicitly in favour of censorship of the press and restrictions on the rights of free speech should they be considered desirable by the sovereign to promote order. The greatest difficulty about the right of succession is in monarchy: and the difficulty ariseth from this, that at first sight, it is not manifest who is to appoint the successor; nor many times who it is whom he hath appointed. For in both these cases, there is required a more exact ratiocination than every man is accustomed to use. In Leviathan, Hobbes explicitly states that the sovereign has authority to assert power over matters of faith and doctrine, and that if he does not do so, he invites discord. Hobbes presents his own religious theory, but states that he would defer to the will of the sovereign (when that was re-established: again, Leviathan was written during the Civil War) as to whether his theory was acceptable. Thomas Hobbes also touched upon the sovereign's ability to tax in Leviathan, although he is not as widely cited for his economic theories as he is for his political theories. Hobbes believed that equal justice includes the equal imposition of taxes. The equality of taxes doesn’t depend on equality of wealth, but on the equality of the debt that every man owes to the commonwealth for his defence and the maintenance of the rule of law. Hobbes also championed public support for those unable to maintain themselves by labour, which would presumably be funded by taxation. He advocated public encouragement of works of Navigation etc. to usefully employ the poor who could work. The third is by mixing with the Scripture diverse relics of the religion, and much of the vain and erroneous philosophy of the Greeks, especially of Aristotle. Hobbes has little time for the various disputing sects of philosophers and objects to what people have taken "From Aristotle's civil philosophy, they have learned to call all manner of Commonwealths but the popular (such as was at that time the state of Athens), tyranny". At the end of this comes an interesting section (darkness is suppressing true knowledge as well as introducing falsehoods), which would appear to bear on the discoveries of Galileo Galilei. "Our own navigations make manifest, and all men learned in human sciences now acknowledge, there are antipodes" (i.e., the Earth is round) "...Nevertheless, men... have been punished for it by authority ecclesiastical. But what reason is there for it? Is it because such opinions are contrary to true religion? That cannot be, if they be true." However, Hobbes is quite happy for the truth to be suppressed if necessary: if "they tend to disorder in government, as countenancing rebellion or sedition? Then let them be silenced, and the teachers punished" – but only by the civil authority. ^ a b Glen Newey, Routledge Philosophy GuideBook to Hobbes and Leviathan, Routledge, 2008, p. 18. ^ Thomas Hobbes: Leviathan – Oxford University Press. ^ Thomas,, Hobbes, (2006). Thomas Hobbes : Leviathan. Rogers, G. A. J.,, Schuhmann, Karl, (A critical ed.). London: Bloomsbury Publishing. p. 12. ISBN 9781441110985. OCLC 882503096. ^ Hilary Brown, Luise Gottsched the Translator, Camden House, 2012, p. 54. ^ It's in this edition that Hobbes coined the expression auctoritas non veritas facit legem, which means "authority, not truth, makes law": book 2, chapter 26, p. 133. ^ Mintz, Samuel (1989). "Leviathan as Metaphor". Hobbes Studies. 2 (1): 3–9. doi:10.1163/187502589X00023. ^ Downame, John (1645). Annotations upon all the books of the Old and New Testament wherein the text is explained, doubts resolved, Scriptures parallelled and various readings observed. London: John Legatt and John Raworth. p. sig. a3r. ^ Aaron Levy (October 1954). "Economic Views of Thomas Hobbes". Journal of the History of Ideas. 15 (4): 589–595. Bibcode:1961JHI....22..215C. doi:10.2307/2707677. JSTOR 2707677. ^ "Leviathan: Part II. Commonwealth; Chapters 17–31" (PDF). Early Modern Texts. ^ "Chapter XLIV". Archived from the original on 3 August 2004. Retrieved 27 September 2004.